The Franklin D. Roosevelt Library and Museum is not just for history buffs. It’s for inquisitive kids, First Lady fans, and feminists, especially those of us who really need a rest stop en route to the Catskills. Located in Hyde Park, just 4 miles outside of Poughkeepsie and about 90 miles north of NYC, the museum is adjacent to FDR’s house and Eleanor Roosevelt’s lady-power cottage, Val-Kill. So, there’s plenty to explore whether you’re digging for Presidential/First Lady Fun Facts or just wandering through the gorgeous grounds and gardens. And while it’s definitely not a children’s museum, our kids were warmly welcomed by the staff here. Our 8-year-old American history scholar (pictured at right, flashing his best FDR face), was thrilled by the place. Our 4-year-old was less enthralled, but she did enjoy posing with the Roosevelt statues, running across the grounds, and stopping to sniff the many flowers we passed along the way. 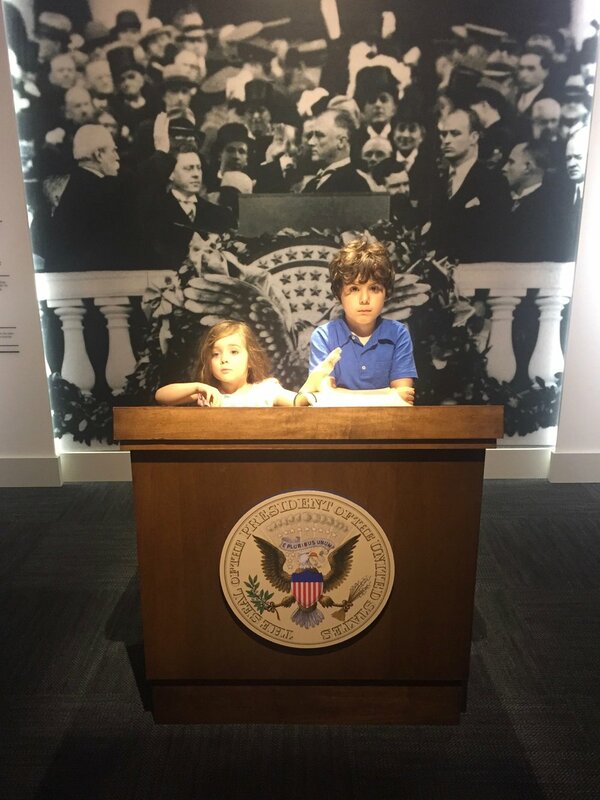 I’d say the whole trip was worthwhile for a photo of the kids at this well-lit Presidential podium. Here, our son declared that his little sister would make a great President because she’s so bossy. She nodded seriously and replied that he could be her VP. He said he might rather be Secretary of the Interior, or something. Fair enough. 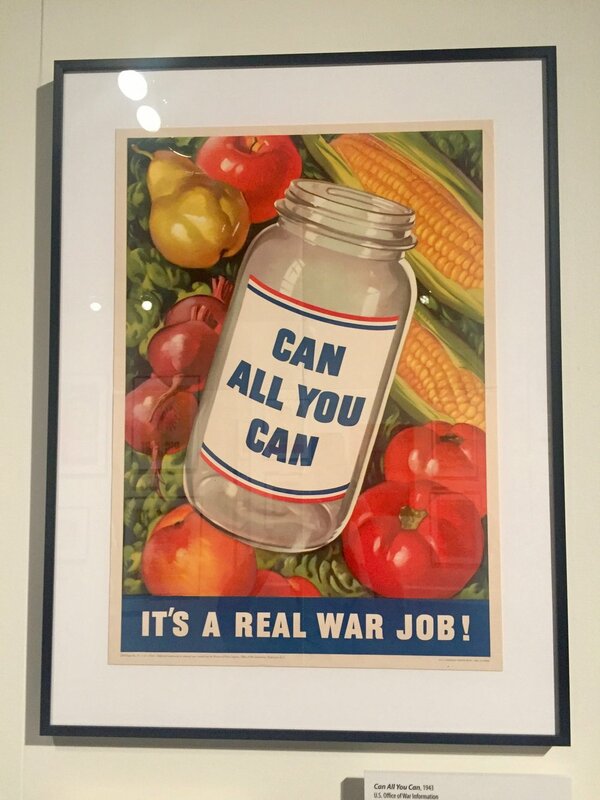 During our summer ‘18 visit, one of the museum’s galleries was devoted to World War II posters. Our son asked a lot of hard questions, but the vibrant graphics made it easier to explain how deeply the war affected every American, whether or not they were serving as soldiers. For the kids, the other highlights of the museum included the annotated collection of knickknacks on FDR’s desk, the disturbingly large lock of hair saved from his first haircut, and President Roosevelt’s extensive collection of model ships. We didn’t make it into the Home of Franklin D. Roosevelt on this trip, but we did drive over to the other National Historic Site across the way, the cottage that Eleanor Roosevelt called Val-Kill. “Kill” is the Dutch word for stream, and a little creek flows through this beautiful property. Here, Eleanor Roosevelt gathered with her lady friends, including her activist besties Nancy Cook and Marion Dickerman, and worked together to create jobs, influence party politics, and advance social reform. On a self-guided tour, you can see cute photos from a Roosevelt toga party and these amazing EMW-monogrammed linens (pictured below), marked for BFFs Eleanor, Marion, and Nancy. Walking through this site, I realized how infrequently I’d been exposed to the work of our First Ladies. I love the Inauguration gowns at the Smithsonian as much as the next gal, but I want my kids to know that First Ladies have more to add to history than a sparkly dress. I felt really proud of myself for bringing them to the place Ms. Roosevelt transformed the role of the First Lady, exerting her influence on the Democratic women's movement and the president's administration—with a little help from her lady friends. I’m totally sending all my feminist friends here to pay homage to these queens. And then we’re gonna monogram some BFF napkins! For more info on this hotbed of Roosevelt history in Hyde Park, NY, check out the websites for the FDR Museum and Library, the Home of Franklin D. Roosevelt, and Eleanor Roosevelt’s Val-Kill.